How to make a canvas, your own custom canvas. Home > Flemish Technique explained > How to make a canvas. 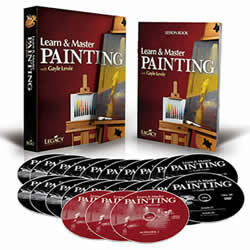 Below I get into the details of how to make a canvas. My solution was to simply make my own. 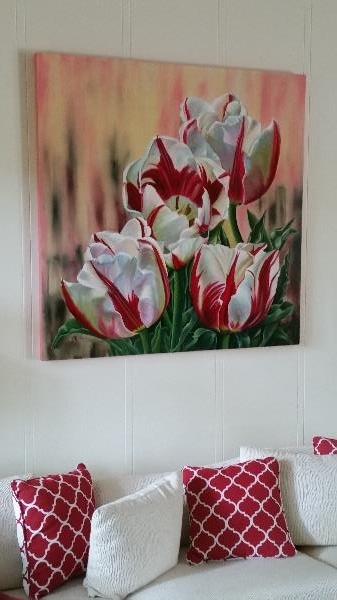 Especially when I checked the price of a similar sized canvas, however not the exact dimensions that had been requested, was going to be over $150! 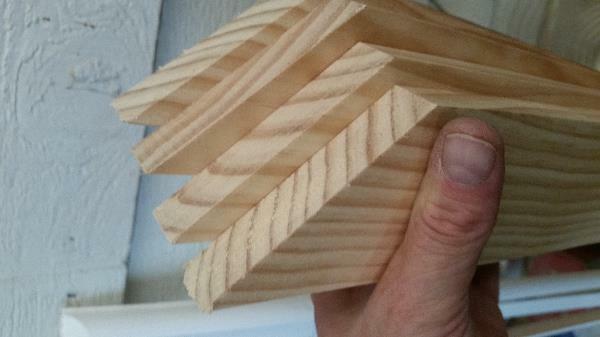 Once home, I cut my pieces to length with a precision miter saw. 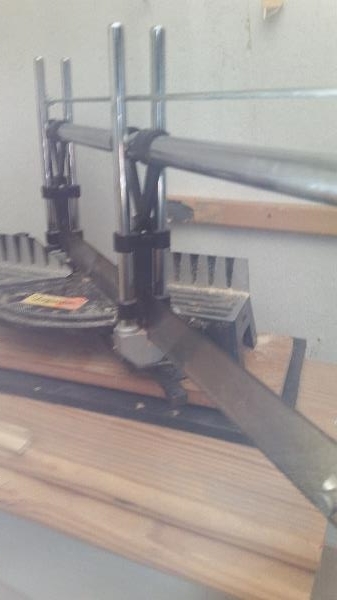 It's pretty old school, but it makes a great 45 degree cut. 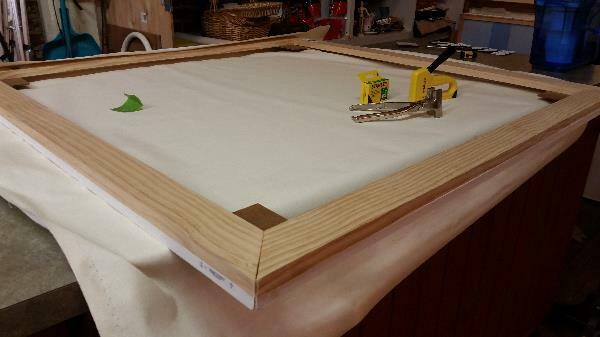 How to make a canvas, assembling your pieces and gluing up. This was done at home in my workshop. 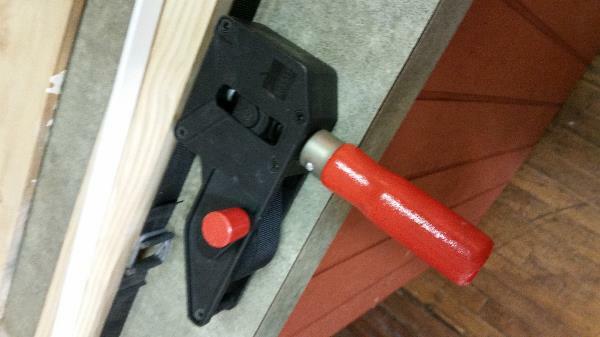 Once back at my studio, I get my lumber and my clamps, glue and get ready to rumble. 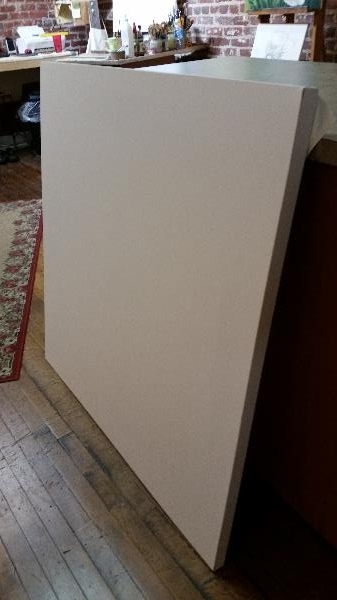 I also picked up 4 pieces of scrap 1/8" masonite pieces about 4 to 6" square. They were laying around my workshop from some previous project. 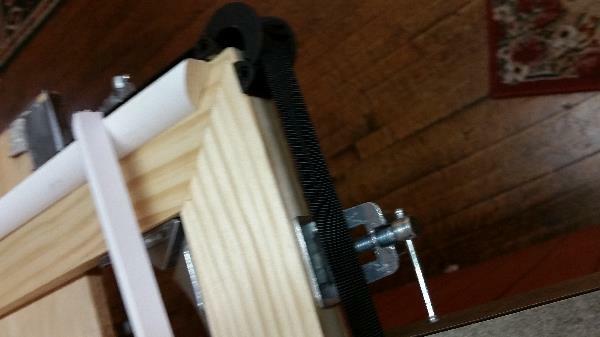 The type of clamps I am using are called framing or corner clamps, and a strap clamp. All available at Lowes, Home Depot or Walmart for cheap. 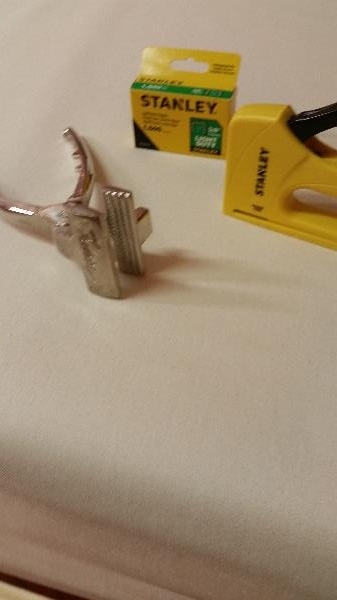 Both items (4 as a set) corner clamps, and the strap clamp were less than $15 each, so I have $30 into the clamps. 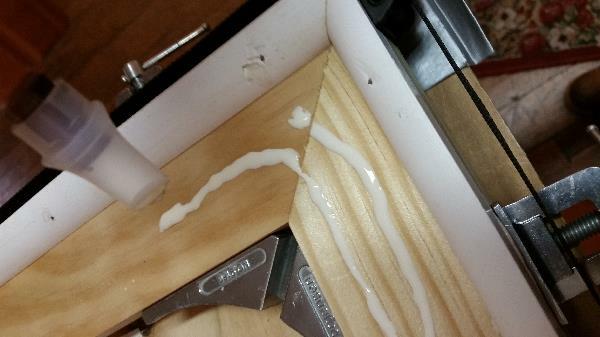 And of course, a $6 bottle of glue. After gluing up the corners of my 1x4 lumber, I position everything for clamping. Once all four corners are glued and clamped (but not tightly) with the corner clamps, I break out the strap clamp and tighten that up (again, not too tight). At this point I measure from corner to corner to verify they are matching, then tap-tap-tap with a little hammer to get perfect squareness. This is achieve when your measurement from corner to corner match (as measured across the frame forming an x pattern with your tape rule). How to make a canvas square! 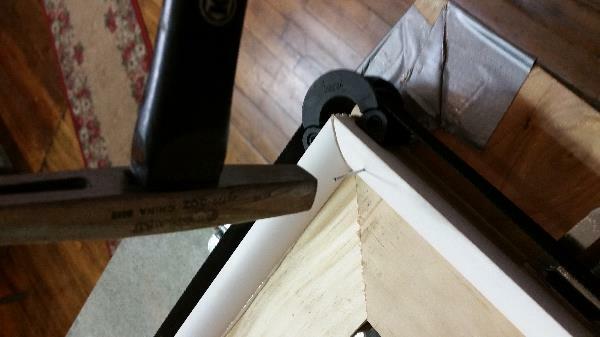 The tapping is done on the corners softly to shift the frame until it is square. 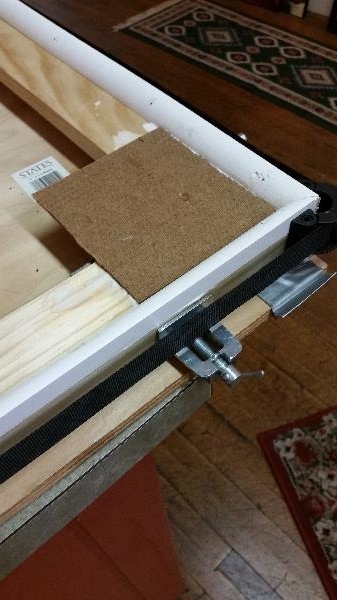 If you can't get your frame to shift, loosen the clamps abit and try again. Once you achieve squareness, tighten things up, and re-measure. You may have to re-adjust, so, don't get excited, just take your time until things are square. 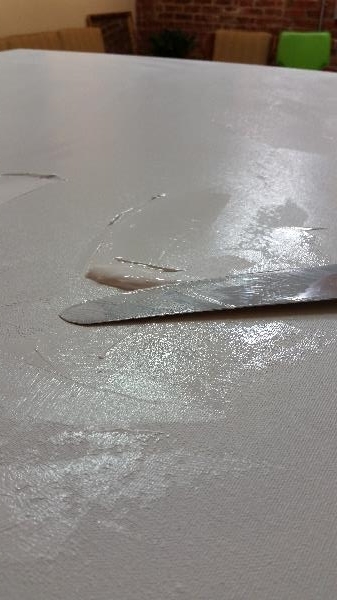 In this particular case the client wanted a 45" square painting, but this process will work for any large canvas rectangle or square that you are making. 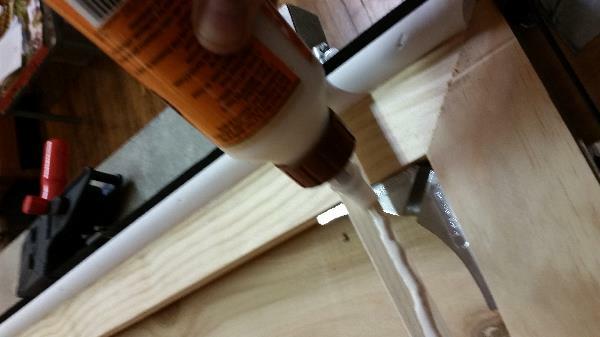 The next few photo's show me gluing then installing with brads, the toe molding. Flat side outwards and round side inwards. 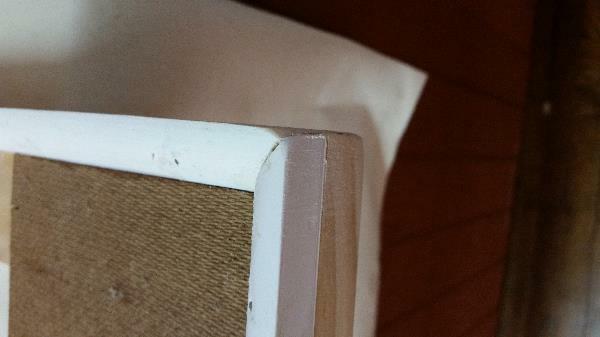 This is how to make a canvas that is offset from the frame and only touches the edges. 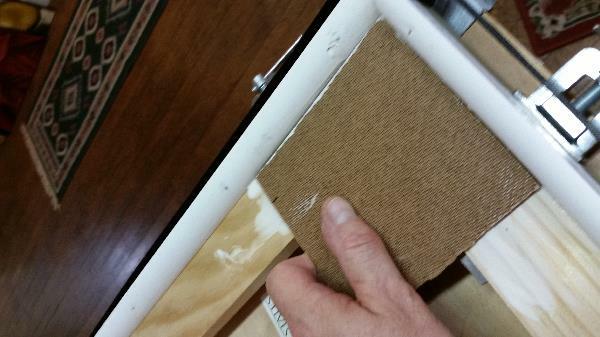 Once this is done for all four sides, I grab my scrap masonite boards and glue every thing up. 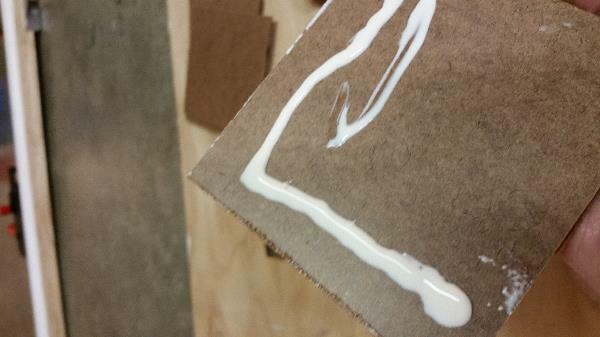 Spreading the glue on both sides will give us a super tight bond. Some folks would clamp these too, but I don't have enough clamps so I just used the 1/2" brads. I used lots of them as this is where the strength of the frame comes from. This one piece of scrap wood! The frame is left on my big studio work bench. You can leave it on a level floor if you don't have a table large enough. It does need to be flat and level. 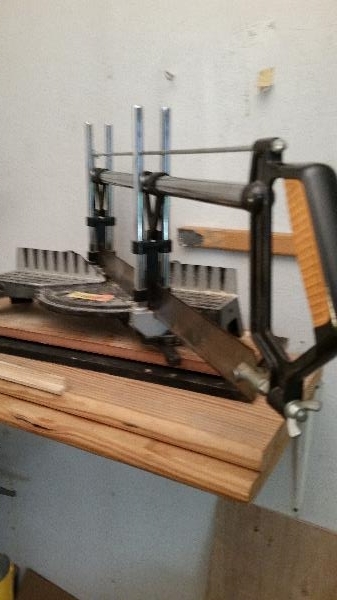 You see this technique used in modern roofing and flooring truss! 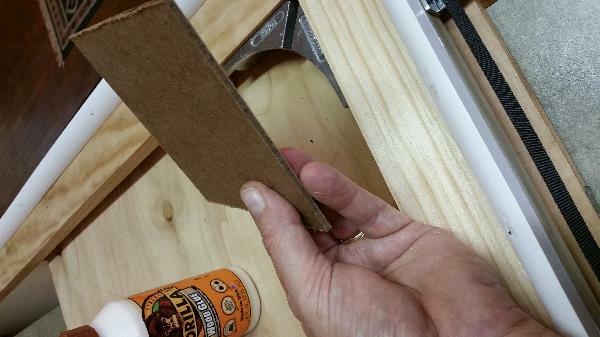 How to make a canvas, gluing up the corner trusses! 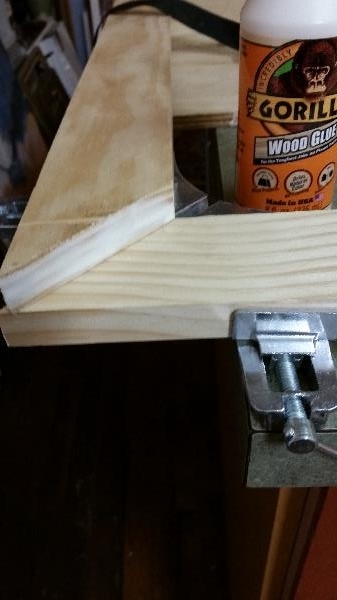 How to make a canvas and nailing up the truss until the glue dries. 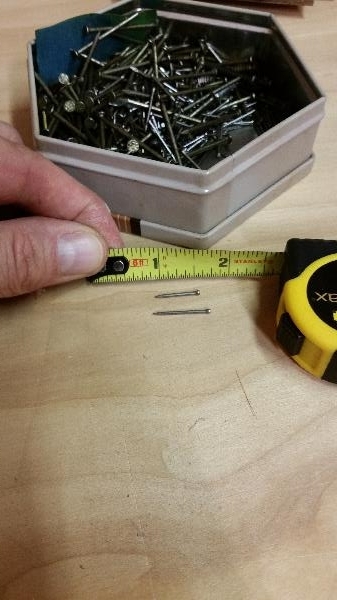 (above) The short brads (nails) are used for the masonite, the longer 3/4" were for the toe molding. (below) Lots of brads. Makes it strong. 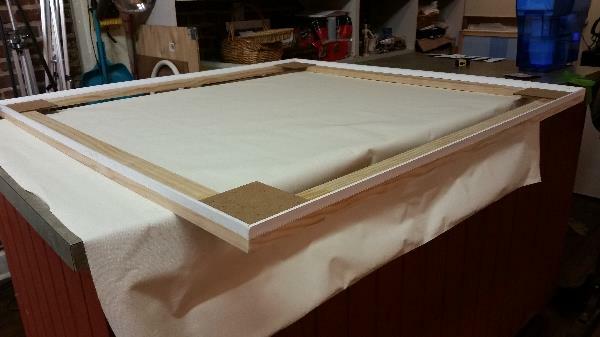 If you are making a canvas that has a side that is over 48" I would recommend using a cross brace. 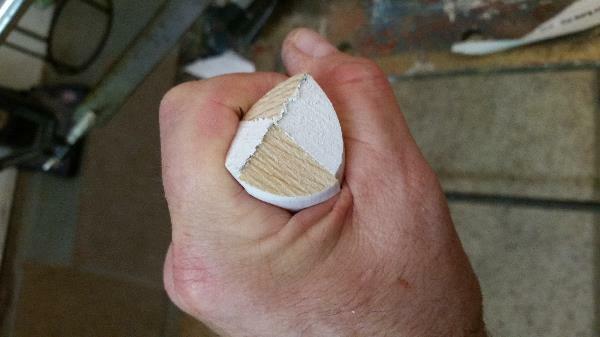 This is simply another 1x4 cut to fit across the short side in between, and centered along the longest side. The purpose is to prevent bowing when the canvas is stretched. 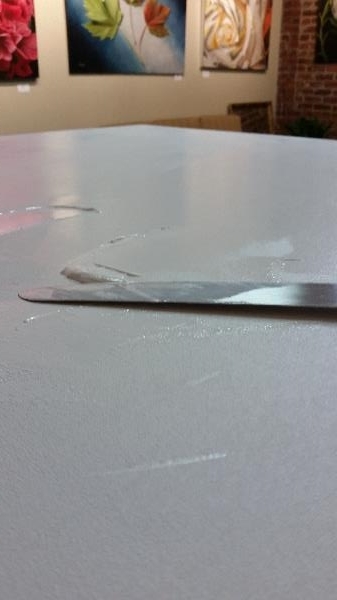 Because I don't find it necessary to stretch my canvas as tight as a drum top, the 45" length was not an issue for me. There are artists that want it so tight, the local marching band line up to practice their drum line solos on them. 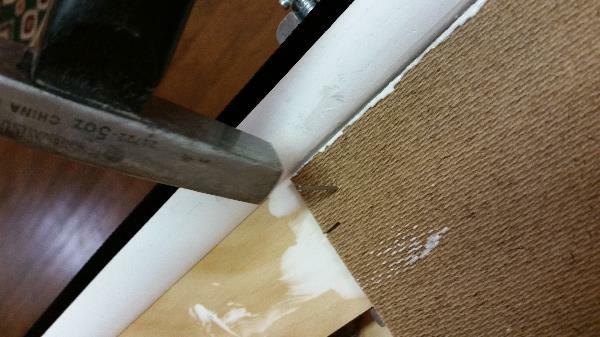 You would glue its ends and use masonite boards exactly like was done in the corner photo's. Now we get into the stretching of the canvas part. There are numerous You Tube videos showing this process, so I will only show my start and a few things to remember. Click here to see me stretching on a smaller piece. 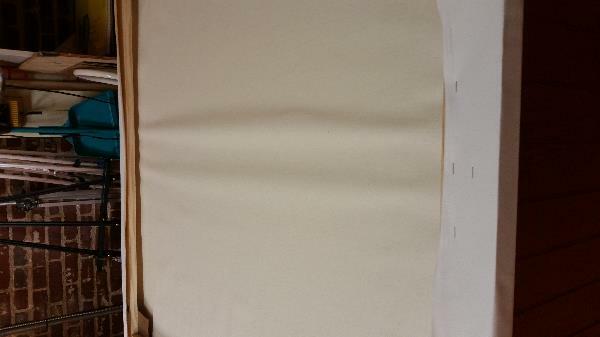 This first photo shows the canvas is cut to size with lots of extra. Easy to trim excess, hard to fix if you cut too little. I then flipped the frame over so the the canvas faces down, the toe molding faces down, and you see the back of the frame. 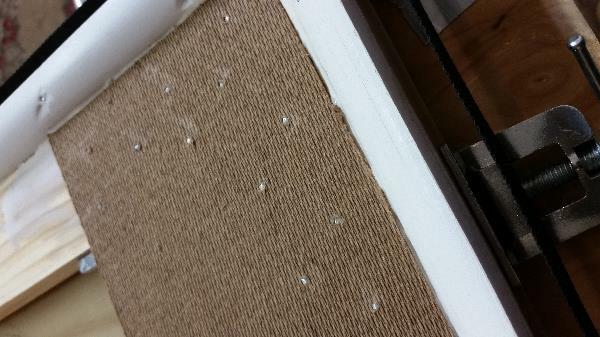 Tools needed are a simple canvas stretcher, and staples, staple gun. 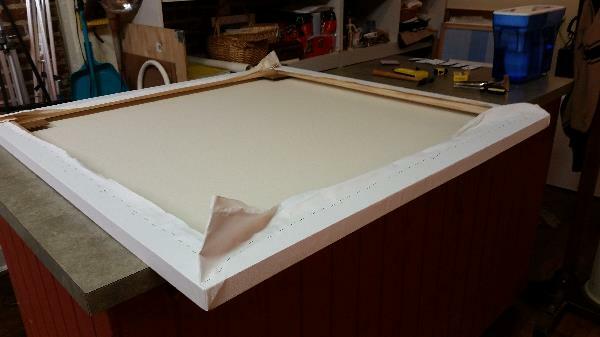 Before starting to staple the canvas, flip the frame! You want the toe molding down. 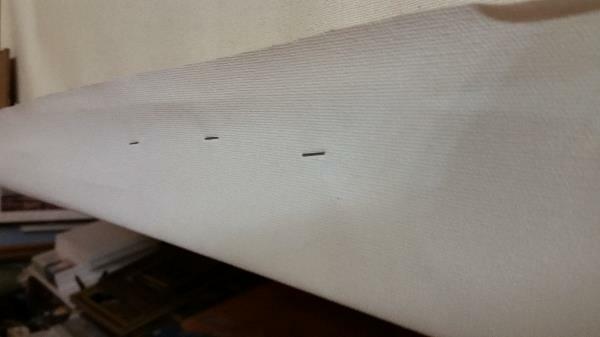 This photo shows my first staples on one side then directly across on the other side on the frame. 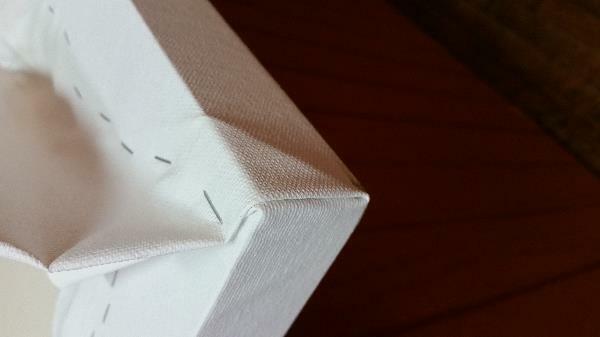 You see alittle bulging of the material, this is normal, and disappears as you work the pattern around. The double fold in the corner is similar to a hospital corner for a sheet on a mattress. I learned this in air force boot camp Lackland AFB San Antonia Texas in 1975. Staff Sergeant Andrews, my drill instructor, would be proud. A completed corner with all it's glory. 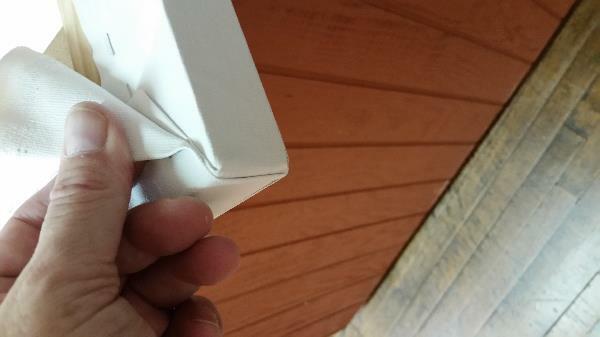 Most folks create the fold on the top and bottom of the frame leaving the sides perfectly smooth. 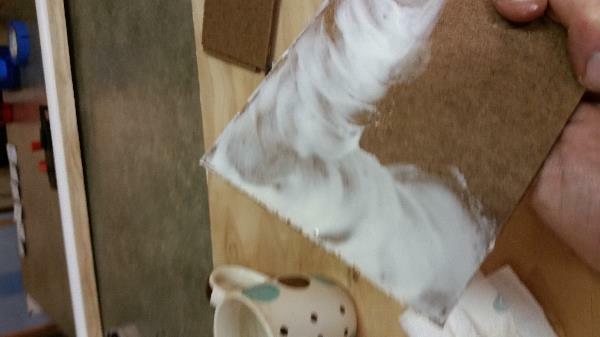 I then begin the process of gesso applications to smooth out the weave of the canvas. And finally, my finished painting with this canvas! 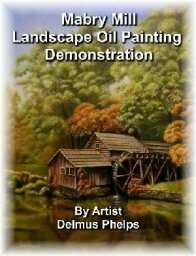 I hope you enjoyed this article on how to make a canvas! Please share the information in your social network feeds, so fellow artists can try this too!